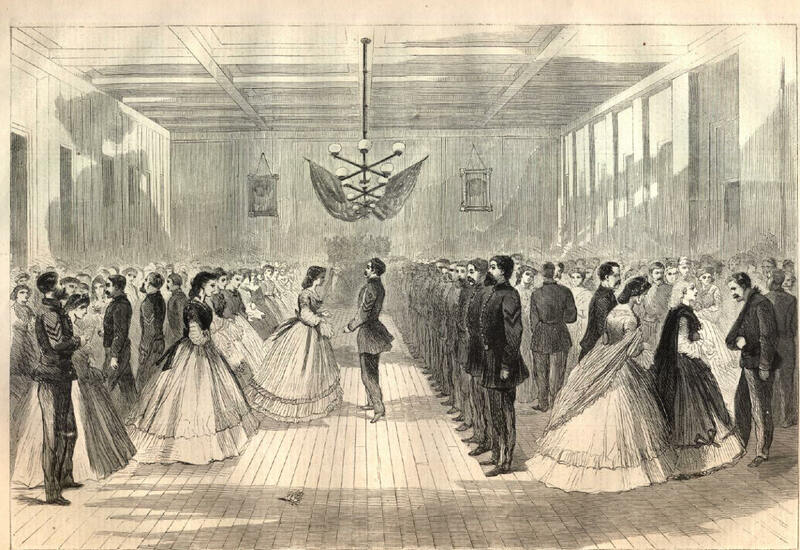 Soldiers’ Ball at Huntsville, Alabama from the April 9, 1864 edition of Harper’s Weekly. Image courtesy of Son of the South. The Christmas of 1864 was a grim holiday season for the Confederacy, with Nashville, Atlanta, and Savannah under Union control, Southern railroads destroyed, and the Confederate army retreating. Sherman’s March to the Sea left Georgia residents with little to be thankful for, leaving some homeless and starving. The previous year, some Southern parents attributed the lack of gifts to Santa not being able to get around the blockade, and in 1864, the situation in the South had deteriorated even further. 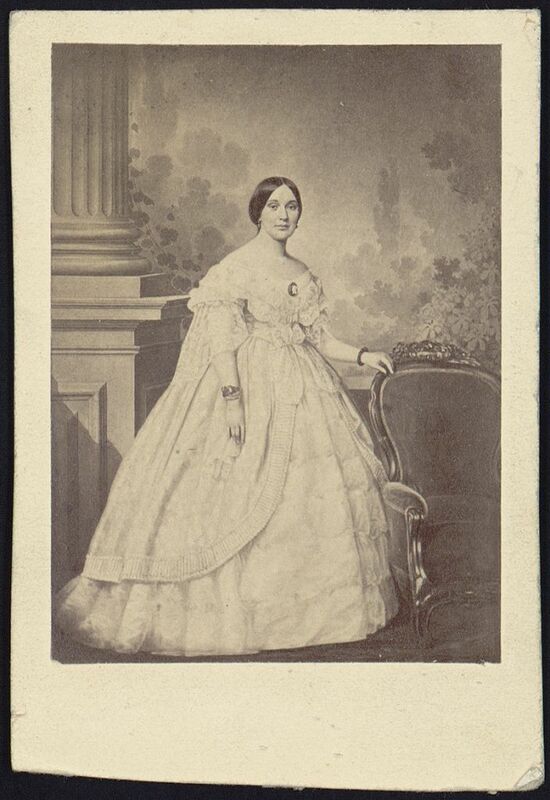 Despite the bleak outlook for the Confederacy in the coming months of the war, Varina Davis, wife of Confederate President Jefferson Davis, upheld her duty as the Southern First Lady, providing for the lower classes and her community. Varina Davis, 1860. Image courtesy of the Library of Congress. About twenty young men and girls gathered around small tables in one of the drawing rooms of the mansion and the cornucopias were begun. The men wrapped the squares of candy, first reading the “sentiments” printed upon them, such as “Roses are red, violets blue, sugar’s sweet and so are you,” “If you love me as I love you no knife can cut our love in two.” The fresh young faces, wreathed in smiles, nodded attention to the reading, while with their small deft hands they [glued] the cornucopias and pasted on the pictures…. Then the coveted eggnog was passed around in tiny glass cups and pronounced good. Crisp home-made ginger snaps and snowy lady cake completed the refreshments of Christmas Eve….In most of the houses in Richmond these same scenes were enacted, certainly in every one of the homes of the managers of the Episcopalian Orphanage. A bowl of eggnog was sent to the servants, and a part of everything they coveted of the dainties. The night closed with a “starvation” party, where there were no refreshments, at a neighboring house. The rooms lighted as well as practicable, some one willing to play dance music on the piano and plenty of young men and girls comprised the entertainment….The officers, who rode into town with their long cavalry boots pulled well up over their knees, but splashed up their waists, put up their horses and rushed to the places where their dress uniform suits had been left for safekeeping. They very soon emerged, however, in full toggery and entered into the pleasures of their dance with the bright-eyed girls, who many of them were fragile as fairies, but worked like peasants for their home and country…. Varina subtly applauds the perseverance of Southern citizens during the hardships of the war, as well as highlights the continued preservation of Southern customs and ideals in her nostalgic and descriptive article. By hosting an event for the orphans, Varina upholds the etiquette and ideals of a Southern lady, selflessly performing her duty to the lower class. By continuing the modified luxuries she and fellow Richmond residents used to enjoy as part of upper class society, she exemplified one of the ways in which she helped lift the spirits of the upper class constituents during some of the most difficult times of the war. Davis, Varina. “Christmas in the Confederate White House,” New York Sunday World December 13, 1896. This entry was posted in Holidays, Memory and tagged Christmas 1864. Bookmark the permalink. Thank you for the delightful post! Mrs. Davis was a true Southern Lady; I admire her self-less actions and genuine care for others.